America first, or Trump first? For us Europeans it should in any case be Europe first. “America First”: the Prime Minister of Montenegro knows what it means now, and the rest of us have all seen it on television. It really means “Trump First”, and woe unto those who risk to obscure his place in the sun. They get shoved aside, so that the Head of the House of Trump can take his rightful place in the first row, chin up, chest out, as shining and pompous as any Trump Tower. 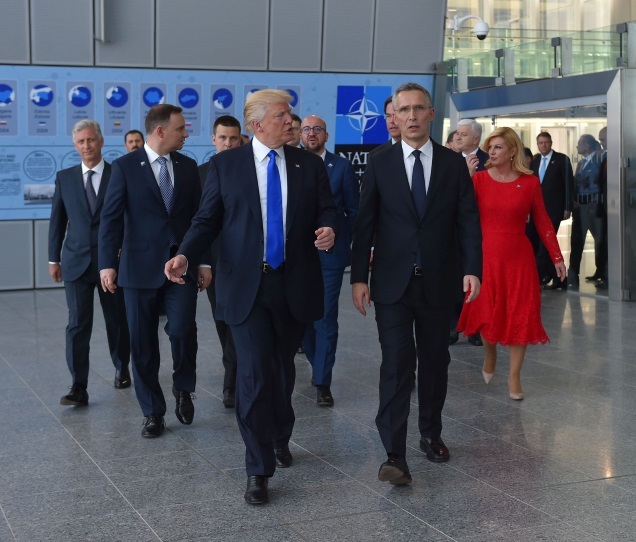 Together with his abrasive speech, those images of the line-up of the NATO Heads of State and Government for the group photo last Thursday 25 May told us all about Trump’s disdain for us soft Europeans. If only we could be like those great allies in Saudi Arabia, put in a $100 billion order for US defence equipment (each, of course), and stop whining about the climate. We’ll have the money, if we follow orders and start spending 2% of GDP on defence. At least, for that’s just the bare minimum, Trump has informed us. And we should stop selling cars, especially German cars, to Americans. Because the Germans are bad, very bad, as the President cared to point out during his visit to the EU. It was Ascension Day, but Donald Trump did not ascend very high in the esteem of Europe. But this is not about Trump, actually. He is just the blustering face of an America that would still be there even if Donald Trump would not have been elected President. That is an America that knows its interests, sets its priorities accordingly, and boldly acts upon them. That’s what great powers do. Since Obama initiated the pivot to Asia in 2012, for US strategy that means China first – no longer Europe first. Anybody other than Trump would have been more polite about it, but the fact would have remained: in today’s world, European and American interests and priorities coincide far less than in the days of the Cold War. To deal with this America, we Europeans must put Europe first. Not as opposed to America, but as opposed to myopic national views. That means to define our interests, assess the world, and set priorities collectively, and to combine together Europe’s assets in all dimensions of power: political, economic and military. That’s not what we do, however, certainly not in the nervous run-up to last week’s NATO meeting. It was all for one, all desperately trying to please one, in order to avoid being the one who would get the most heat from the fiery President. The result? Some have cooked the books, only pretending to have done more than they really have. Some were already increasing defence spending, but that will not get us that much more capabilities, certainly not the strategic enablers that we don’t have and that no single European country can afford. Europeans do not need to spend 2% of GDP on defence. We need to integrate our defence, so that if everybody spends a reasonable amount, together we can field all the capabilities that our strategy requires, and that allow us to act alone when necessary, in a cost-effective way. The mechanism is there, in the EU: Permanent Structured Cooperation. Now if ever is the time for France and Germany to activate it and together with the able and willing build the integrated forces that would give us strategic autonomy. That story we can only tell convincingly if we tell it as a group, also in NATO. The EU as such is not a member of NATO, but nothing prevents the European allies and partners from preparing a common position beforehand. Having opted for Brexit, the UK will no longer be able to veto this. At all future NATO Summits therefore, we Europeans should speak as one. As we should in the G7, in the UN, and, of course and most of all, as the EU. On defence, on trade, and on foreign policy. Trump can still stand in the first row, but he’ll be surrounded by Europeans who pull their weight, on their own terms, and who know what they want. Prof. Dr. Sven Biscop, an Honorary Fellow of the European Security and Defence College, directs the Europe in the World Programme at the Egmont – Royal Institute for International Relations in Brussels and teaches at Ghent University.